We&apos;re only hours away from what we expect is the launch of the Samsung Galaxy A90, along with a range of other Galaxy A handsets, and that leaves time for one more leak. 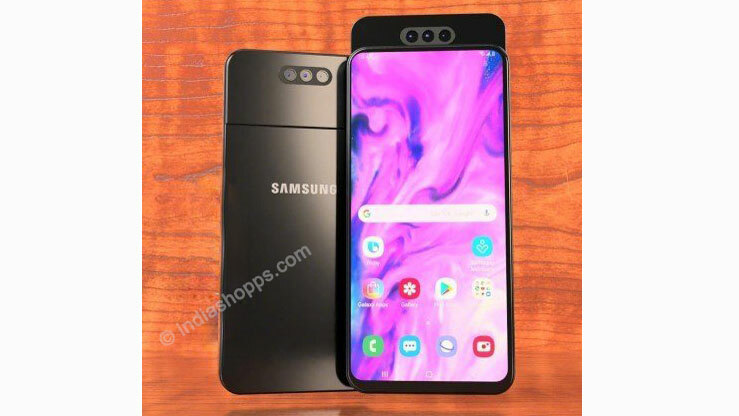 Images published on Indiashopps show the front and back of the Samsung Galaxy A90, and all eyes are on its chunky pop-up camera panel. What do we want to see in the Samsung Galaxy Note 10? Is the Samsung Galaxy S10 Plus the best phone around? As the images show, there&apos;s a panel at the top of the phone which can be extended. When it&apos;s down it houses the three-camera rear setup, but when it pops up there are also three cameras facing forward too. We&apos;d heard rumors of this massive pop-up panel before, and if the leaked images are real it makes for an interesting new feature. Pop-up front-facing cameras are becoming a new trend in smartphones – we&apos;re expecting the upcoming OnePlus 7 to have one – but these are usually small, and only house one or two cameras, but the Samsung Galaxy A90&apos;s panel apparently takes up its whole width. Another product we&apos;re expecting to see is the Samsung Galaxy A80, and the scores from a benchmark test have just been leaked. In a multi-score test run by SamMobile, the Galaxy A80 apparently scores 6732, which is a fair score for a mid-range device. The test also suggests the handset will use a Qualcomm chipset, but which isn&apos;t specified. We won&apos;t have long to wait before we find out everything we need to know about these phones – the launch event is later today, and TechRadar is there to cover it. You can follow our Samsung Galaxy Event live blog for up-to-date information and our expert analysis, or watch a livestream of the event yourself when it starts in a few hours.